Food delivery service Deliveroo wants to force its riders to become self-employed, and lose the benefits of employed workers. The hyperflexible and precarious nature of gig economy jobs, especially those that are managed through smartphone apps, makes organisation difficult for the workers. But an action in Belgium shows how ETF-affiliated unions are supporting Deliveroo riders in their fight for fair conditions. 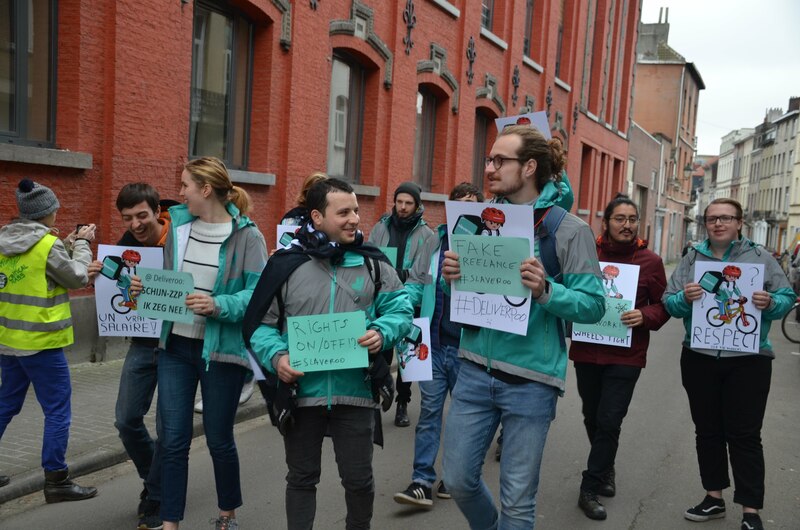 The Collectif des coursier-e-s (a Belgian organisation of Deliveroo riders) protested at the offices of SMart, the organisation that administers their work contracts, on Saturday 27 January. They were supported by activists from the Belgian union BTB-UBT, and a delegation of 20 Deliveroo riders from the FNV union in the Netherlands. Mac Urata, ITF automation/future of work coordinator, said: “What is happening to these riders in Belgium is an example of the way many so-called ‘gig economy’ companies are behaving. They use labour classification loopholes, such as self-employed, as an excuse to slash wages and working conditions. But they won’t get away with it because workers, like in Brussels, are fighting back and demanding their rights. They have the full support of the ITF and all our unions in this crucial battle to stop this attempt by Deliveroo to escape it responsibilities to the most important part of its business – its workers”. Check out this video (in Dutch and French) capturing scenes from the day!